We offer you the best in kids entertainment! Choose from the activities below and only pay special combo rates! 6) Popcorn Machine, supplies, and operator. 9) Candy Floss machine, supplies, and operator. 4)Popcorn machine hire, supplies, and operator 1 hour. 5)Candy Floss machine, supplies, and operator 1 hour. 4)Popcorn machine hire, supplies, and operator 1.5 hours. 5)Candy Floss machine, supplies, and operator 1.5 hours. 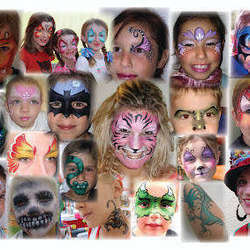 Beautiful, professional grade nontoxic face and body paints. Fun hands on craft station with an entertainer supervising so parents can relax. We provide a selection of animal puppets for the kids to make. -R600 for the first hour, R400 per following hour. R10 per child per craft. Who doesn't love sand art? This is a wonderful activity that will keep your kids entertained for hours. We provide a supervisor and the full set up. -R600 for the first hour, R400 per following hour. R10 per child per sand art card. Glitter tattoos are waterproof so perfect for pool parties and events of any kind. Beautiful and sparkly they are loved by young and old, dermatologist approved and last up to 7 days. An awesome new product imported from the UK. We have hundreds of styles of stencils available all you have to do is chose one and in a minute you have a new Air Brush Tattoo that will last up to 7 days. Perfect for a girls themed event, with a huge selection of designs and colors to choose from, it will be sure to keep your little ones entertained. Motorbikes, Butterflies and hearts with teddy bears, Ponies, and almost anything you can imagine can be crafted out by our balloon artists. Have fun with our interactive mascot. We provide themed sing along and dance along music, our friend will hand our sweeties and small prizes, and dance with your little ones. It will be a dream come true! Mascots available are: Barney, Mickey and Minnie Mouse, Easter Bunny, Hello Kitty, Winnie the Pooh, and many more. 45 minute program. R1350. Per mascot. 45 minute program. R2,200. 2 Mascots. Invite a fuzzy bunny family to your event and enjoy bunny petting and feeding time. All our bunnies are hand raised and are loving and friendly. Weekend Hire: R500 per week end. Weekday Hire: R300 per day. Towering over a meter higher than the average adult, you will be in AWE.This act is accompanied by balloon sculpting. Keep all your kiddies entertained with our fun party games with prizes. Games we offer are, newspaper freeze dance, treasure hunt, blind man’s bluff, taken the beacon, tug of war, cotton race, pass the parcel, and red light green light. All our Entertainers will be dress professionally, in smart colored vest and at colored hat. Please request specific costumes for theme events. 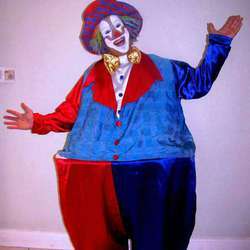 Have our entertainer dressed to fit your theme and request a costume hire. Clown, Spiderman, Elsa, Anna, Princess, Prince, ballerina, cowboy, cowgirl, Pocahontas, Moana, fairy, superman, and many more. To confirm an event we request a 30% deposit and the remaining can be paid on the day of the event either by eft with proof of payment or in cash to the entertainer.